How Coffee and Cocoa's Particle Size Affects Flavour! Chocolate and coffee, what a great combination! But which do you prefer – milk chocolate and a regular cup of coffee or perhaps an espresso with a square of dark chocolate? Milk chocolate and dark chocolate have different compositions and would be expected to taste differently but why does an espresso taste different from a regular cup of coffee if they are made from the same beans? Are there any similarities between coffee flavor and chocolate flavor? The taste of the coffee we drink depends very much on the particle size of the coffee grounds as well as the roasting method, the brewing pressure and the water temperature. 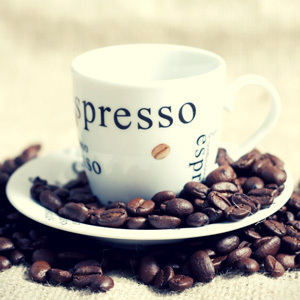 I’m an espresso fan – a coffee requiring a dark roast, a fine grind particle, a high brewing pressure and high temperature. The small particle size gives a high surface area to the coffee, allowing the bitter organic components associated with an intense espresso shot to be released during preparation. If you prefer a smoother coffee, then a lighter roast with a coarser grind would be better, as less of the bitter components are then released. So what are the similarities with chocolate then? Well, both particle size and temperature will also affect our perception of our favorite confectionary. Chocolate is a complex non Newtonian material that displays different properties depending on the ingredients and process conditions. The degree of processing can influence the particle size of the chocolate, which determines how gritty or smooth the chocolate feels in the mouth. Particle concentration, size and size distribution of solids will also affect chocolate rheology with higher solid content chocolates and those with smaller particle size being more viscous and more non-Newtonian. The flow behavior of chocolate can be described in terms of its yield stress and plastic viscosity. The yield stress is related to the energy required to initiate flow and the plastic viscosity related to the energy requirement for maintaining flow. These values are obtained by fitting a suitable rheological model, such as the Casson model, to a rheological flow curve. Both these parameters will affect the perception of the chocolate flavor in the mouth; a higher plastic viscosity makes the chocolate stay longer in the mouth and slows down the diffusion of particles to the taste receptors. A higher yield stress results in a thicker coating of chocolate on the palette that prolongs the flavor perception. Therefore it is not just the amount of cocoa that is responsible for the differences in taste between milk and dark chocolate for example. The amount of milk solids and sugar in combination with the surrounding fat will influence their rheological properties which in turn impacts on both the texture and taste perception of chocolate. So, whether you are a French, American, Italian or Cinnamon roast drinker and whether you like your chocolate rich or milky, why not visit us at stand 9,912 at Foodtech 2014? We will be running demos of particle size & rheology measurements which can help you ensure your food and beverage products delight the taste buds every time. Rheology – the master chocolatier!